Last night, we went to the movies. My daughter thought that Beauty and the Beast was playing, but when we got there, we discovered it wasn’t playing until Thursday. We chose to see King Kong instead, but this left us with an hour to kill. 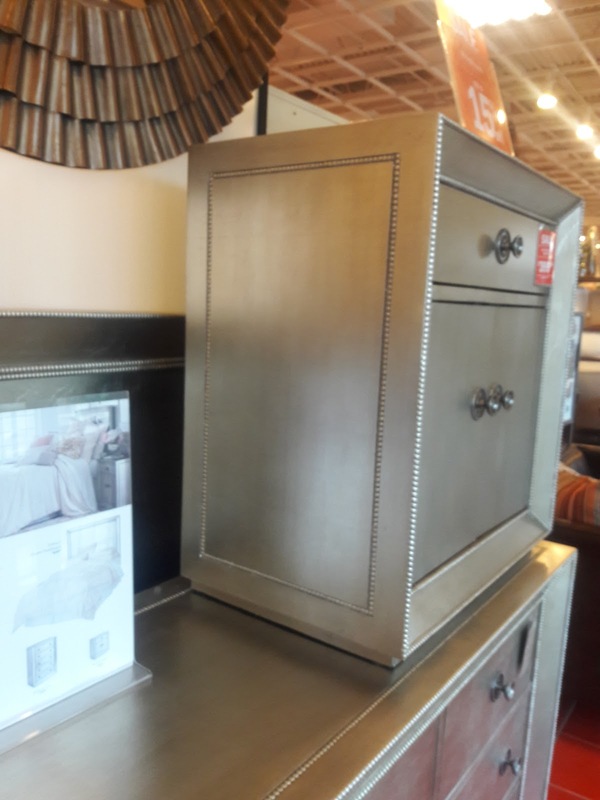 Never one to waste a moment, we decided to walk over to Pier 1 Imports for some ideas. The interior of the RV is currently tan and brown. It looks a bit dated and worn, and some of the walls are essentially paper over wood. After spending some time looking around the RV yesterday, I decided that I would probably paint the walls and cabinets to brighten and update it. I’m not really sure about the color scheme that I want. I always love greens, but I want something different. 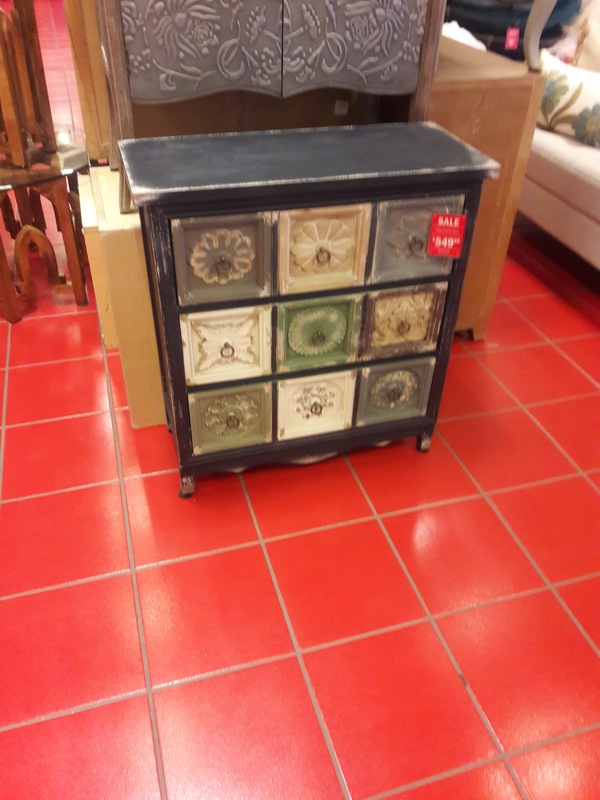 I saw this piece of furniture, and I fell in love with the color. This silver (called champagne) is bright, but picks up on the colors around it. 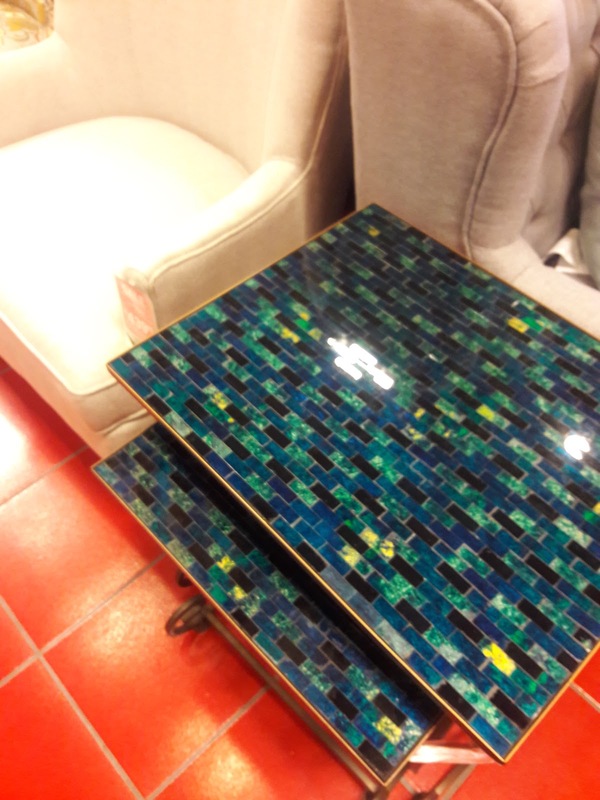 For instance, the store had red tile floors, so I had to make sure to avoid getting much of the floor in the picture. If you look at the bottom right corner of the picture, you can make out the reddish tinge on the dresser. You can compare that with the tan in the upper left corner, which also influences the color you see. 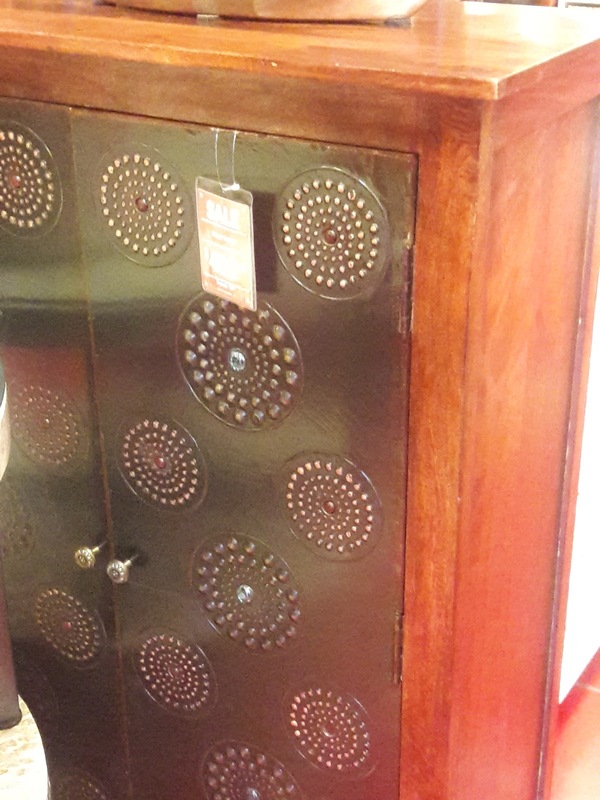 The one thing that I was unsure about was the silver with the dark brown rug, but as I look at the picture, I see the mirror is dark brown, and looks fine. With the color scheme basically decided, I know I want to break it up with decorative elements. This tile on the cabinet was one thing I was considering. I also LOVE this bead work with crystals. It brings a touch of the whimsical into it, plus, I can choose beads that are different colors, to complement other design choices I want. I am really leaning toward something like this. It may entail a trip to the mainland to find the beads, but maybe I can find what I’m looking for with Amazon (a Keys dweller’s dream). Finally, I saw this piece. I love the tile, so I took a picture, but I am not sure if it will go with the overall look. I think the colors will be nice, but I want to avoid too much blue. It does give me an idea of complementary colors, though, and all would look nice with the champagne color of the walls. I must have soft cushions everywhere. I love lounging when I want to read or relax, and I insist on comfort. 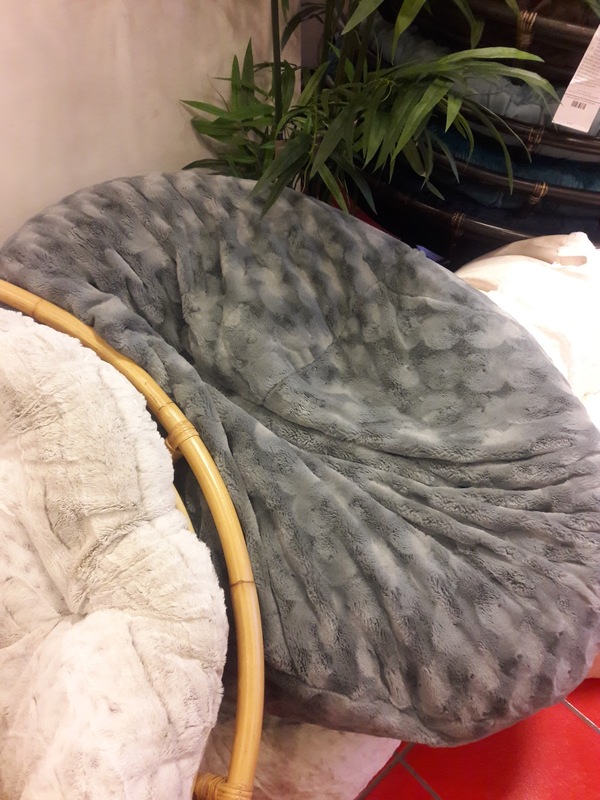 This papasan cushion offers both plushness, comfort, and the right color. I will not be paying the $100-$200 that they are asking, but I will find a similar fabric to recover the existing couches and chairs. Finally, in the bathroom, our tub has a crack. My partner will be fixing it, but I don’t want to commit huge sums to replacing it. In an effort to make it pretty, though, I have decided on something like this to place on the bath tub floor. These mats will both hide the crack and patch, as well as protect from slips, and they are under $20. I get paid this Friday, but my next off day isn’t until Sunday, so I suspect at that point, I’ll be making a trip to Marathon Home Depot for some paint and supplies. For now, I will start conducting an inventory of the stuff the previous owners left. I know there are superfluous dishes that I neither want, nor need. I also need to get an idea of what kind of shelving or organizing racks will be necessary. It is a nice, cool day, so I plan to get busy in the RV. I’m sure I’ll have more to report very soon!